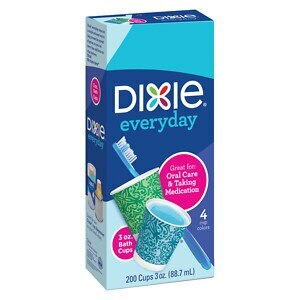 Fast forward, when Hubby and I were in our early married years, I decided to class up our bathroom act with Dixie cups and we are Dixie cup people to this day. Those little 3 ounce paper cups are handy. So, when Youngest Daughter announced she was moving out, I asked her (among many other things) if she wanted to take the Dixie cup tradition to her new place. She did, and I told her I would buy her a dispenser. Unfortunately, Dixie has only one style of despenser for sale at any given time and for reasons I won’t bore you with, I am not impressed with the current model. With the entire internet available at my fingertips, I decided to look around and see if I could find an older model for sale she could use. Dear lord, that is when I found out the two dispensers we have sitting in our bathrooms, purchased many years ago, are now “vintage” per the many Ebay listings for them that I found. Sigh. It used to be that things I had as a child were vintage. Then things I had as a teenager were vintage. Now things I had in my 20s are vintage. I am beginning to get the distinct impression that I am vintage. Anyway, “vintage” Dixie cup holders are definitely more expensive than new ones. Looks like Youngest is going to get a new one, whether or not I like the design. And in 30 years it can be vintage!